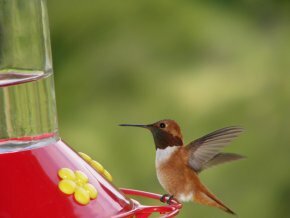 Make hummingbird food for a feeder with this recipe and enjoy watching the hummingbirds feeding. Boil the water, then slowly add sugar. Boil the solution for several minutes, then let it cool. (This boiling and cooling process will help avert the growth of yeasts and bacteria). Pour the solution into a clean hummingbird feeder. Refrigerate any leftover nectar. Don't add artificial food dye because it may harm the birds. Change the nectar in the hummingbird feeders at least every 6 or 7 days. Clean the feeders with soap and water before adding new nectar.